Thunder Bay, ON: The Thunder Bay International Baseball Association (TBIBA) today announced that the International Baseball Federation (IBAF) has selected Thunder Bay, Ontario to host the 2010 World Junior Baseball Championships, one of the highest profile international baseball tournaments outside of the Olympics. 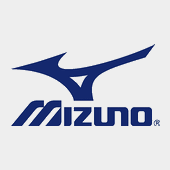 Participation from all baseball playing regions of the world, namely Asia, the South Pacific, Africa, Europe, North America, Central America (Caribbean) and South America is expected. The biennial event will take place over eleven days in July of 2010. “The Thunder Bay International Baseball Association, since its inception, has had the goal of hosting a World Championships one day. That day is now a reality.” stated Larry Hebert, President of the TBIBA. 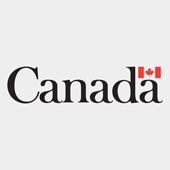 “We have been building our resources and expertise and overcome several barriers to be considered as a World Championship venue.” The announcement comes after many years of preparation that included the successful hosting of the Canada Cup (2004) The Three Nations Cup (2000) and the Gore Motors Honda Nations Cup (2000) and two previous bid attempts. 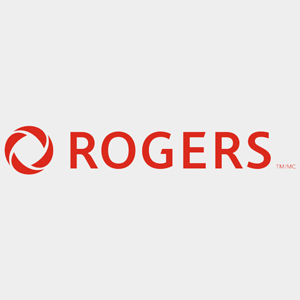 Support for the successful bid was received from the Ministry of Health Promotion and the City of Thunder Bay Sport Bid Administrative Advisory Committee and Baseball Canada. "Thunder Bay being awarded the 2010 World Junior event is a testament to their hard working and dedicated hosting group." says Baseball Canada President Ray Carter in a congratulatory note. "They have been a great supporter of our National Teams and National events and its only fitting that they finally get to host an International event." 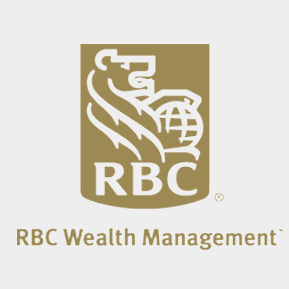 The World Junior Baseball Championships date back to 1981. Since 2000, the 12 team event has been held every two years and involves the Under-19 National teams of member countries of the International Baseball Federation. The tournament is regarded as a launching pad for players aspiring to play professionally. Players such as Larry Walker, Russell Martin, Éric Gagné and Adam Loewen and are among the more than 40 Canadians who have participated in the event before moving on to sign professional contracts. “Preparation for this event will bring many enhancements to our community and we anticipate that it will leave a legacy of better opportunities for ongoing recreation for our residents,” points out Larry Hebert. “But preparation for the event will take cooperation from many segments of our community. The Thunder Bay Baseball Association work on upgrading the facilities at Baseball Central and promoting the game of baseball throughout the city is a great example. We are looking forward to inviting others into the fold for this exciting challenge.” The other host countries have included USA, Mexico, Australia, Cuba and Chinese-Taipei. Acknowledgements: An announcement on October 19th committing $200,000 to a successful bid was made by the Province of Ontario through the Ministry of Health Promotion’s program for supporting International Amateur Event Hosting. The support of Baseball Ontario, Baseball Canada and USA Baseball was also received to support the bid for the event. For more information about the TBIBA and their plans to host the 2010 World Junior Baseball Championships: Warren Philp Executive Director TBIBA(807) 343-2016 IBAF World Junior Baseball Championship Facts · Since, 2000, the 12 team event has been held every two years and involves the Under-19 National teams of member countries of the International Baseball Federation; · There have been 22 competitions dating back to 1981. Besides Canada, hosts have included the USA, Mexico, Australia, Cuba and Chinese-Taipei; · A total of 46 games are played. Countries competing represent all baseball playing regions of the world, namely Asia, the South Pacific, Africa, Europe, North America, Central America (Caribbean) and South America; · Twelve countries compete in the World Junior Baseball Championships over 11 days which includes one rest day; · To become eligible, countries take part in regional qualifying events usually in the year prior to the event; · The twelve countries which competed in the Cuba event recently held in September 2006 included Spain, Italy, Holland, South Africa, Mexico, Cuba, Canada, United States, Chinese-Taipei, Australia, Brazil and Korea. Canada won the bronze medal at that event; · More than 40 Canadians have participated in the event before moving on to sign professional contracts; · Several Major League stars have played in this event including Larry Walker (retired), Eric Gagne (Dodgers), Matt Stairs (Tigers), Adam Loewen (Orioles), Russell Martin (Dodgers) Stubby Clapp (former St. Louis Cardinal) from Canada; Alex Rodriguez (Yankees), Mike Mussina (Yankees), Shawn Green (Mets), Ryan Klesko (Padres), Greg Zaun, (Blue Jays), Brandon League (Blue Jays), Joe Mauer (Twins), Michael Cuddyer, (Twins), Jeremy Bonderman (Tigers), JJ Hardy, (Brewers) and Chad Billingsley (Dodgers) from the United States, and Shin-Soo Choo (Indians) for Korea; · The event’s hockey counterpart is the World Junior Hockey Championships. From Kelly Thesier, reporter for MLB.com MINNEAPOLIS -- Justin Morneau had some stiff competition when it came to earning American League Most Valuable Player honors, and that was just on his team. But while the Twins had multiple candidates for the league's award, Morneau came out on top Tuesday as he was announced as this year's American League MVP. Despite many people expecting Yankees shortstop Derek Jeter to win the award, Morneau's breakout season earned him the honor bestowed by the Baseball Writers' Association of America. Morneau received 15 first-place votes, eight second-place votes, three third-place votes and two fourth-place votes for a total of 320 points. Jeter, the runner up, received 12 first-place votes, 14 second-place votes and one fourth-place vote for 306 points. Boston's David Ortiz finished third with 193 votes, and Frank Thomas finished fourth with 174. All Morneau did in 2006 was to put together one of the best offensive seasons in Twins history. The first baseman hit .321 with 34 home runs, 97 runs scored and 130 RBIs, ranking second only to Ortiz, who led the AL with 137 RBIs. He was the first Twins player to hit 30 or more home runs in a season since 1987, and his 130 RBIs rank second best in team history to Harmon Killebrew's 140 in 1969. But while it was a career year for the 25-year-old, it didn't begin that way. Coming off the 2005 season, in which he hit just .239 with 22 home runs and 79 RBIs, Morneau was on a similar track after the first two months of the 2006 season. A rough road trip on the West Coast at the start of June showcased all that had been going wrong for the both the club and Morneau, but everything soon changed. After June 8, Morneau had the best batting average in the Majors (.362). In that stretch, Morneau also had the most hits in baseball (145) and the most RBIs in the AL (92). And it doesn't take much to link the Twins' turnaround to Morneau's emergence, as the club was 25-33 through June 7 before going 71-33 the rest of the season, the best record in the Majors during that span. Morneau's turnaround came after a meeting with Twins manager Ron Gardenhire on that West Coast road trip, when the first baseman dedicated himself fully to baseball. "I think [Morneau] put it best -- you get tired of making outs," Gardenhire said at the time. "You kind of have to figure out what you have to do to get better as a player and a person, and I think he said it best. He was tired of not getting it done." Morneau certainly proved himself to be among the best in the league, but he wasn't the only Twin to receive votes for the award. Both Joe Mauer (116 votes) and Johan Santana (114 votes) also earned consideration for the prestigious honor. Mauer made history in 2006, becoming the first American League catcher to win a batting title, as he hit .347 on the year. The 23-year-old was also the youngest batting champion since Alex Rodriguez (21) in 1996. The consistency that Mauer showed throughout the season was enough to leave most of his teammates in awe, including Morneau. "I watch Joe and he makes it look so easy," Morneau said earlier this season. "Everybody wants to hit like that. Everyone can kind of learn from the way he hits and his approach, as he doesn't seem to chase too much. Having a guy like that around helps me and everyone else, really." Santana already earned some postseason hardware, as he was named the AL Cy Young Award winner last week. Santana held the honor of pitching's Triple Crown, as he was tied for the lead in wins (19) and led the league in ERA (2.77) and strikeouts (245). But while others questioned who should be the MVP -- of either the Twins or the AL -- Santana felt the answer to both questions was simple. "My money would be on Justin Morneau," Santana said last week. "If you go by the numbers, he has the numbers. And if you go by what he did for our team, it's just amazing." 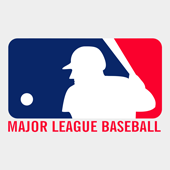 Kelly Thesier is a reporter for MLB.com. This story was not subject to the approval of Major League Baseball or its clubs. 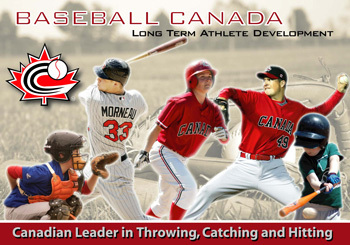 Baseball Canada with be conducting two try-out camps during the month of December 2006 and January 2007. The purpose of the try-outs across the country is to evaluate potential National Team candidates to represent our Nation at the scheduled up-coming IBAF sanctioned World Cup of Women's Baseball Tournament. 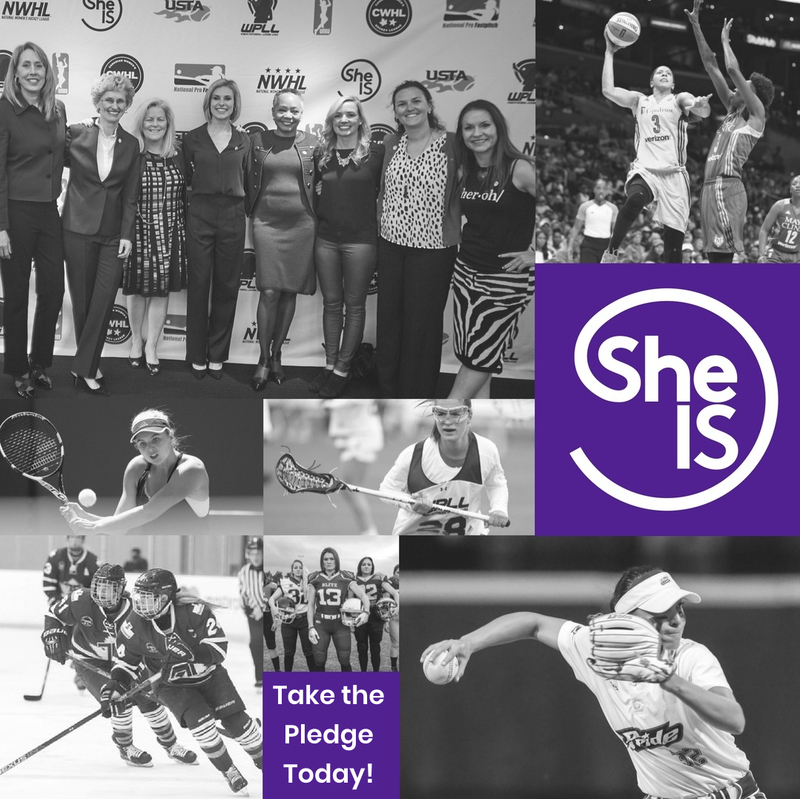 All Women athletes, regardless of their affiliation and who are15 years of age and older, are eligible to participate at the Open National Women's Team Try-outs. There is no cost to participate at the camps. All interested athletes must Pre-Register by email. Moncton Camp Date: December 9th 2006 from 10am to 12pm Location Site: New Brunswick Community College, 1234 Mountain Road, Moncton. Other camps and dates will be scheduled next Spring. Greater Toronto Area Camp Date: January 12th 2007 from 7pm to 10 pm Location Site: Frozen Ropes Baseball and Softball Training Centre in Oakville, ON.- 2009 Wyecroft Road Oakville, ON In addition, leading up to this tryout, Frozen Ropes in Oakville will be conducting workouts for any girls looking to prepare for the tryout. 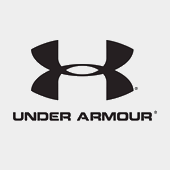 They will be held at Frozen Ropes in Oakville on Monday January 8th and Wed January 10th from 7-10 pm. We encourage pre-registration as space is limited. For more information or to register they can contact us at 905-847-7697 or by email at coachsam@frozenropescanada.ca. Pre-Registration: To register for the National Women's Team Try-out Camps, please send an email to National Team Head Coach André Lachance at alachance@baseball.ca prior to December 1st (Moncton) and January 5th (Toronto). To register for the camps you must send your full name, return phone number, camp you will be registering for (Moncton or Toronto), current age and primary position. Your confirmation of registration will be completed by a return email. 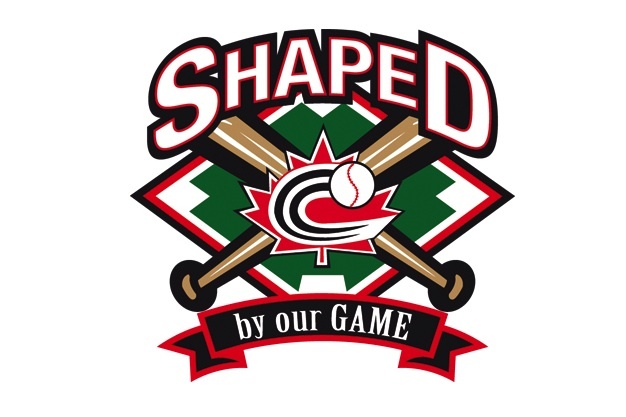 The City of Moncton, New Brunswick will host the 2006 edition of the Baseball Canada Super clinic from December 8th to the 10h. 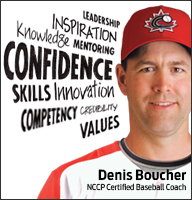 Intended for Canadian coaches who seek further development of their amateur careers and to access NCCP Certification at the Regional Coach, Level 2 and Level 3 tiers, the clinic has the objective to support the development of coaches on all aspects of the game of baseball. 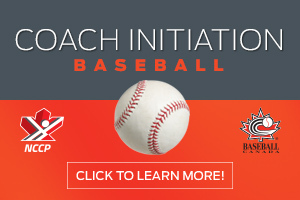 With the theme of offering a complete clinic, Baseball Canada in collaboration with the Baseball New Brunswick is offering you a variety of great clinicians. Alex Agostino, technical director with Baseball Québec and former pitching coach with Team Canada, will discuss pitching and preparation, along with explaining how he would develop his pitching staff through proper mechanics. Pete Caliendo, President of Caliendo Sports International, a worldwide baseball company that trains individuals, teams, coaches and deals in professional baseball operations worldwide, will talk about hitting and base running, while Mike Mcrae, current Head Coach at Canisius College in NY, will address the elements of team defense, practice planning and outfield play. 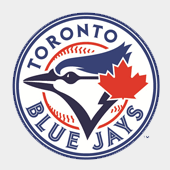 Jeff Krushell, of Krush sports performance and former strength and conditioning manager with the Toronto Blue Jays, will share his secrets on baseball training and conditioning for players and pitchers. Additional instructors will round off this diverse group of clinicians and deliver the other components. As a baseball coach, you do not want to miss this unique opportunity where expertise, knowledge and drills will be shared among all participants. 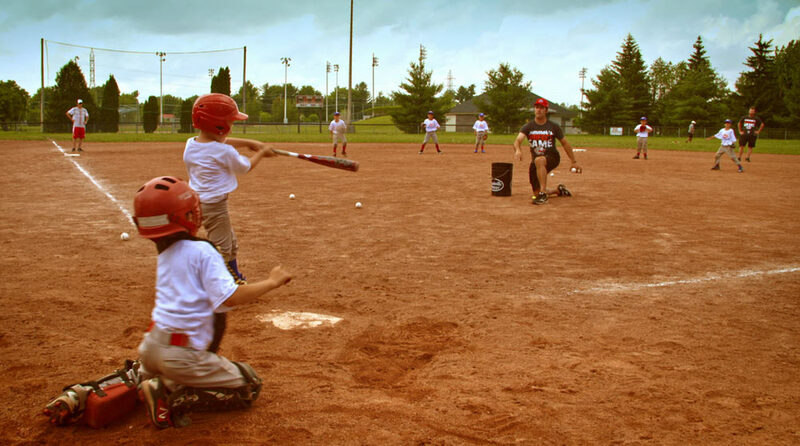 Cost to attend the Super Clinic is $75.00 for coaches taking their NCCP (Baseball) Level 3 Technical, $40 for coaches taking NCCP (Baseball) Level 2 Certification, and FREE to all other coaches and players as a result of Baseball New Brunswick’s new membership fundraiser. Players may also attend any of sessions at no fee. For more information on the Super Clinic contact the Baseball New Brunswick office at (506) 451-1329 or by email at baseballnb2003@nb.aibn.com. 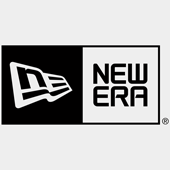 Details will also be posted on the Baseball New Brunswick website at www.baseballnb.ca. HALIFAX, N.S. – Baseball Canada recognized some of its hardest working members, Saturday, at an awards Gala held in conjunction with the federation’s 2006 Fall Convention. Ollie Schroeder (Manitoba) was named volunteer of the year, while Blair Hains (Ontario) was honoured as the top official and Jason Chee-Aloy (Ontario) as the country’s best coach. Infielder and designated hitter Amanda Asay (British Columbia) was given Baseball Canada’s women’s national team most valuable player award and British Columbia was named best provincial association. Ollie Schroeder’s name has been synonymous with Manitoba’s Red River Sports League for over 20 years. She has been a very active, dynamic volunteer, serving as President, Secretary, Treasurer, Registrar, Baseball Convenor, Tournament Co-ordinator, Umpire Assignor, League Scheduler, and Hit-Run-Throw contact as well and Umpire and Coach Clinic Contact. The number of teams in the Red River Valley Sports League has increased over the last two years, a trend directly attributed to Ollie’s efforts. 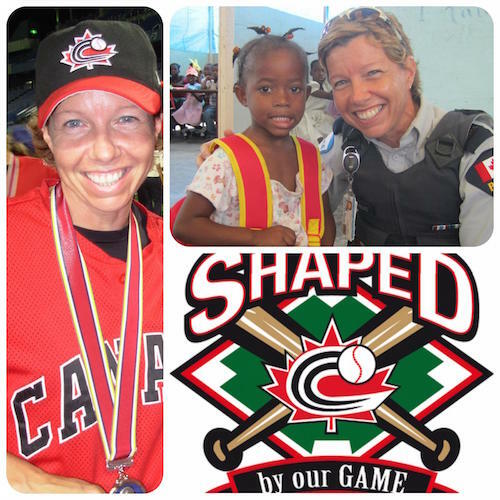 Her fund-raising initiatives have helped reimburse umpires and coaches for their training in addition to allowing for the creation of bursaries for graduation players, maintenance on batting cages and the organizing of the league’s 25th anniversary celebrations. On a provincial level, Ollie has helped co-ordinate a number of regional and provincial championships in addition to sitting on an extremely high number of committees dedicated to every aspect of the sport. Blair Hains has been a tremendous asset to umpire development at the provincial and national level for over 24 years. 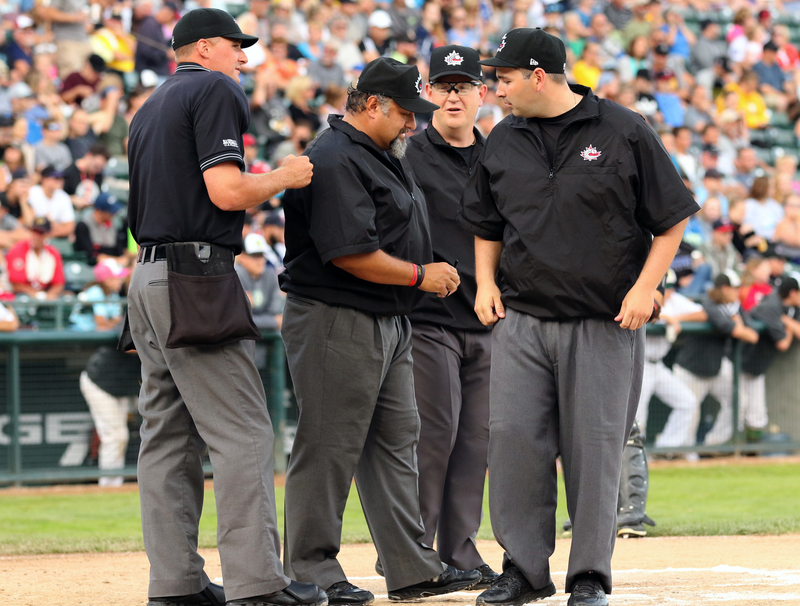 His dedication and commitment to improve the umpiring and in particular the training of umpires has led to many improvements in Baseball Canada’s programs. He has not only focused on improving the national program, but is also actively involved in the grassroots development of Canada’s future umpires. In the past year alone, Hains has acted as the Assistant Supervisor of Umpires for the Senior National Championships as well as Co-ordinator and Assignor for the Premiere Baseball League of Ontario. He was also the lead instructor and co-ordinator of Baseball Ontario’s “Ontario Cup” for umpires – a weekend-long event that brought umpires from across the province to a training camp with the ultimate goal of receiving their invitations to the national program. Over 20 umpires were in attendance along with six master course conductors. It was Hains’ responsibility to ensure all members understood and implemented their roles effectively. The success of this evaluation camp is a direct result of Hains’ leadership and influence. Jason Chee-Aloy has a broad background in baseball including a current involvement with the Major League Scouting Bureau in addition to guiding Baseball Ontario’s 2006 Youth Team to the Canada Cup Championship in Medicine Hat, Alta and managing an 18-and-under team based in Toronto, Ont. Hundreds of players have benefited from Chee-Aloy’s experience and dedication to the craft of coaching. In 1994 he led the North York Baseball Juvenile Team to the first of back-to-back championships in the Metro Toronto Amateur Baseball Association. 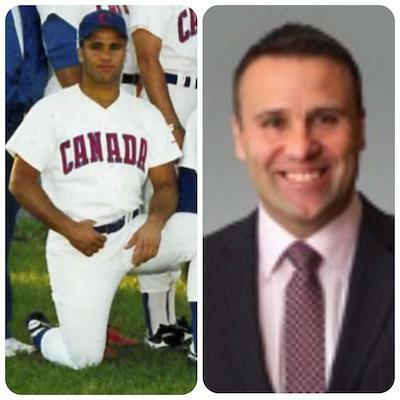 In 1996 and 1997 Jason Managed the North York Juvenile team to six different tournament championships including the Ontario Summer Games before winning the Baseball Canada Junior Championship in 1998. He then moved onto manage Ontario’s 18-and-under team, winning four different championships in 2000 and 2001. Over that span 16 of his players were selected for Baseball Canada’s National Junior team, 17 were drafted and 30 accepted athletic scholarships throughout the United States and Canada. Both on and off the field, Chee-Aloy’s most significant achievements in coaching came this season while assembling the Ontario Youth Team that captured the gold medal at the Canada Cup. He was able to select players from a plethora of different programs to unite them and mould them into a championship-calibre unit that would win Ontario its second straight Canada Cup title. In her second season with Baseball Canada’s Women’s National Team, Amanda Asay (Prince George, B.C.) played a key role in helping Canada win the bronze medal at the 2006 Women’s World Cup in Chinese Taipei. Boasting a .500 batting average, the first baseman and catcher was selected to the tournament all-star team at first base. Asay, who collected 9 RBI over the course of the tournament, led her team in almost every offensive category. British Columbia won the province of the year award for the fourth time. Although they did not win and gold medals in this year’s various national championships, British Columbia had a very good year, finishing second overall in championship performance. The province won a silver medal in the Pee-Wee, Midget and Canada Cup events. British Columbia had the top performance in the registered player category, increasing their membership by over 3,300 players. They also finished in first place for national team membership. 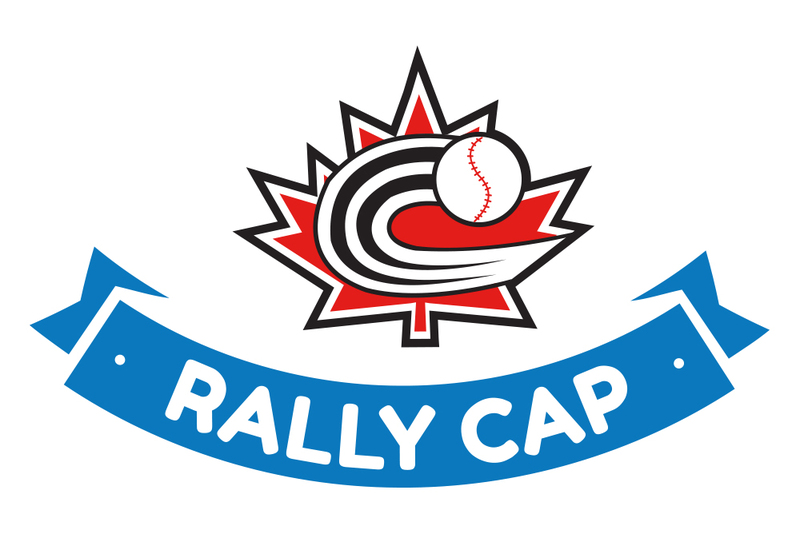 The province had a solid performance in the Coaching and Winterball/Rally Cap categories, finishing second and third respectively in those areas. The Stetson University Hatters shutout Baseball Canada’s national junior team 13-0 behind only nine hits, Sunday, in the final game of the 2006 Fall Instructional League in Deland, Florida. The Instructional League, which serves for Baseball Canada as the first of four steps in the selection process for the 2007 National junior team, allows Canada’s stars or the future to face elite-level athletes from Division I college teams and developmental professional teams who belong to Major League Baseball Organizations. For the second straight day, seventeen-year-old Chad Stang (Surrey, B.C.) was 2-for-3 in a losing effort while 16-year-old Michael Mutcheson (Morden, Manitoba) was a perfect 2-for-2. They were the only Canadian players to collect hits. Canada issued 11 walks, hit five batters and committed three errors, allowing the Hatters to score 13 runs on nine hits even though they stranded 12 runners on the base paths. Stetson jumped out to a quick 4-0 lead in the first inning behind one walk, two hit batsmen and three consecutive singles allowed by starter Cameron Gray (Toronto, Ont.). However, Stetson pulled away when they scored three runs with two away in the second inning. After the two first batters were retired, a hit batsman was followed by a single, two walks and a throwing error to make it 6-0. A wild pitch allowed the seventh run to score Two walks, another plunked batter and a single made it 9-0 in the third before Stetson added two more in the fourth and solo markers in the sixth and seventh. The second step in the selection process for the 2007 National Junior Team will take place during Baseball Canada’s Spring Training program slated for April 18 to 29, 2007 at Disney’s Wide World of Sports Complex in Orlando, Florida. “Baseball has been in my soul for as long as I can remember. My grandpa put a baseball in my crib when I was a baby and something must have rubbed off.” John HindleAuthor: Jackrabbits in the Outfield In the newest book that delves into Canadian baseball history, John Hindle, the original general manager of the high-flying Winnipeg Goldeyes and two-time Northern League General Manger of the year, tells the story of how a highly successful professional baseball team surprisingly sprouted from the farmlands of Manitoba. After picking up his first call from a phone sitting on the floor of an empty room which was to become his club’s front office, Hindle helped the Goldeyes become a model organization in a time where minor league baseball teams were disappearing from the Canadian landscape. After his departure from professional baseball in 2004, Hindle began typing into his computer stories about the people he met and events that shaped his decade-long journey as general manager in the Northern League of Professional Baseball – predominantly the years in which he helped the Goldeyes become one of most successful baseball teams in Canada. “Eventually I looked at all of it and I thought I’d turn it into a book because there was so much of it,” said Hindle, whose position with the Goldeyes gave him a behind-the-scenes vantage point as the Winnipeg club become increasingly popular. Hindle’s story of how he virtually instantly went from small business owner selling baseball equipment to top-dog in the Goldeyes’ organization makes Jackrabbits in the Outfield a tale that resonates far beyond the foul lines or the outfield fence. “Not only does this book provide a glimpse of what it’s like to be on the inside of a phenomenally successful pro sports team, but also of what it’s like to live your dream,” said Hindle. The author’s chronicles capture the mystique that lures in baseball fans like the sound of the crack of a bat or the smell of fresh cut grass. However, it is also a story about the pursuit of a dream as well as the magical and unforgettable journey one takes to make that dream come true. “Readers are going to see the kind of passion that can arise from living out your dream job,” said Hindle. “It doesn’t matter if it’s in sports or baseball or any other avenue. Everybody can relate to the hope of working in something they have a tremendous amount of passion for. That’s what shines through in this book.” Jackrabbits in the Outfield is available in stores throughout Manitoba including McNally Robinson Book Sellers, Chapters, Coles, and Homerun Sports. Readers outside of Manitoba can purchase the book at www.jackrabbitsintheoutfield.com. 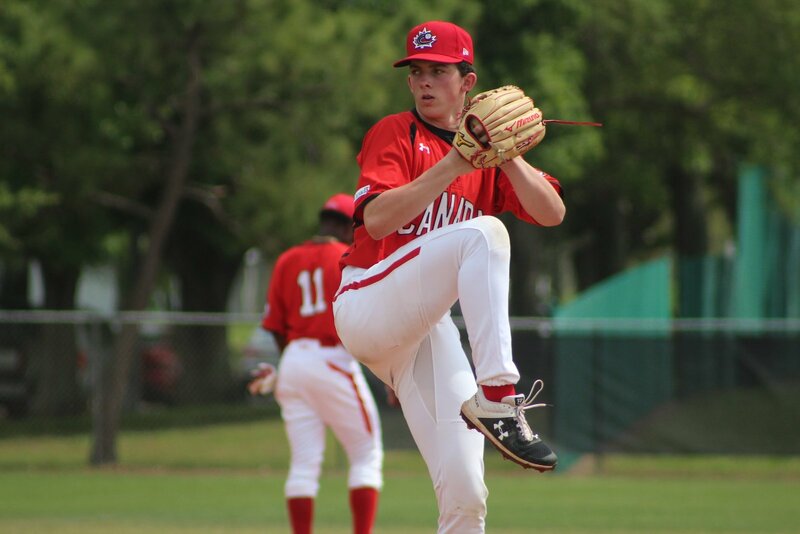 Baseball Canada’s national junior team prospects ran into tough pitching, Friday, in a 10-0 loss to the Atlanta Braves instructional team at Disney’s Wide World of Sports complex in Orlando, Florida. Marc Bourgeois’ (Granby, Qué) 2-for-3 effort at the plate couldn’t spark Canada’s offence as Chad Stang (Surrey, B.C.) was the only other Canadian to collect a hit. Atlanta did most of its damage in a five-run fourth inning where six hits, including a two-run homerun, and one error allowed the Braves to take a 7-0 lead. Atlanta scored solo markers in the first two innings and added three more in the sixth. Daniel Lazarou (Newmarket, Ont. ), Corey Pappel (Mississauga, Ont. ), and Ryan Kennedy (Calgary, Alta.) no-hit the Braves over the final three frames – Lazarou pitching the seventh, Pappel the eighth and Kennedy closing out the game. Starter Olivier Routhier-Paré (Montréal, Qué. ), and Kyle Lotzkar (Delta, B.C.) gave up five runs each over the first six innings. Canada’s next match-up comes against the Stetson University Hatters, Sunday, at 2 p.m. in Deland, Florida. 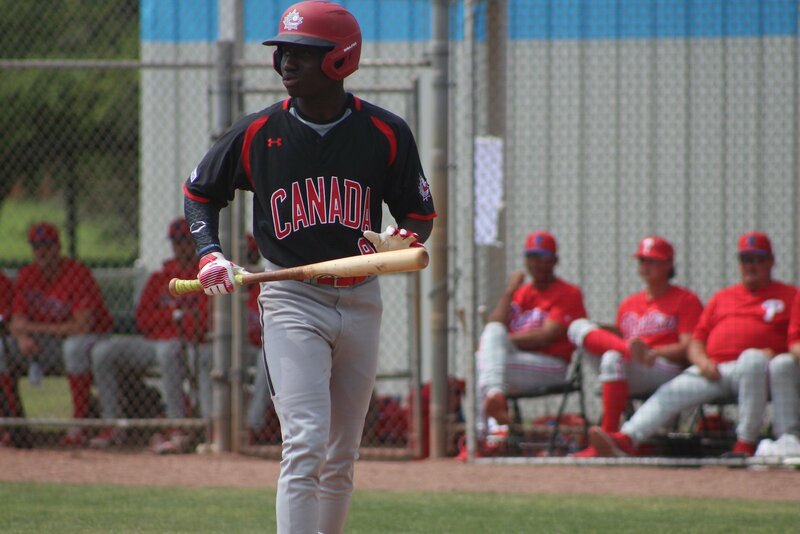 Baseball Canada’s national junior team stranded 11 runners and dropped a 6-0 decision to the Cleveland Indians’ instructional team, Thursday, at Disney’s Wide World of Sports Complex in Orlando, Florida. After winning their first game in the 2006 Fall Instructional League on Wednesday, Canada was unable to take advantage of six walks issued by the Indians’ pitching staff. Cleveland, however, had more success in converting 50 per cent of its base runners into runs. The Indians first struck with three runs in the third inning highlighted by a two-run triple and an RBI-single off of reliever Daniel Britton-Foster (Ladysmith, B.C.). A pair of walks and a hit batsman loaded the bases for Canada in the bottom half of the inning, but with one out Chad Stang (Surrey, B.C.) struck out and Leslie Williams (Scarborough, Ont.) grounded out to end the inning. It was the first of two occasions where the Canadians had three men on base with one out, but were unable to score. 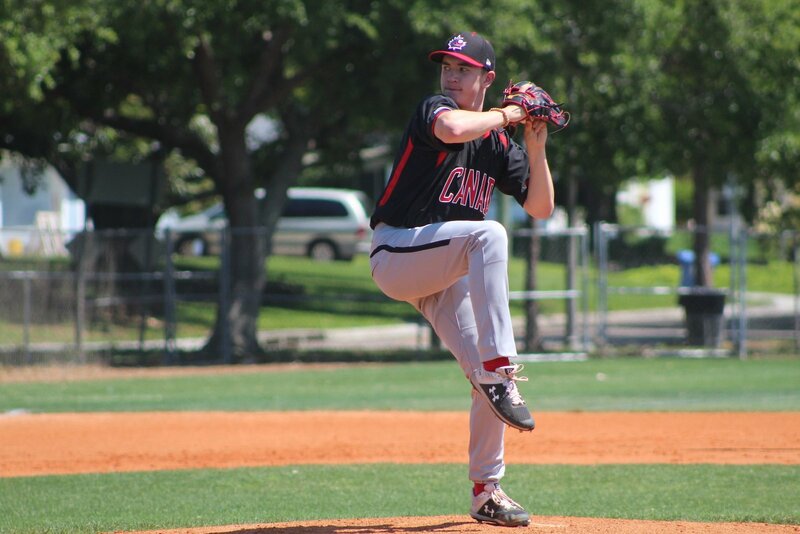 Cleveland pulled away in the sixth inning when Nick Weglarz (Stevensville, Ont.) drew a two-out walk and scored on a double to left-centre before an RBI single made it 5-0. The Indians added a final marker in the eighth inning on an infield single and an error. Canadian starter Shain Beaudreau (Cole Harbour, N.S.) was impressive over two shutout innings, allowing two hits and striking out two. 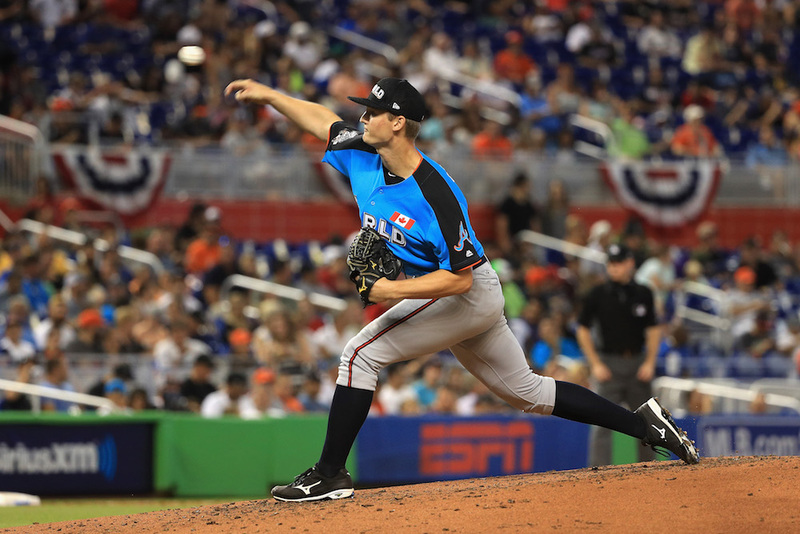 Britton-Foster gave up three runs over the next two innings, Matt Jebb (Toronto, Ont.) gave up two runs on three hits while pitching the fifth and sixth innings and Mitch Hodge (Vancouver, B.C.) threw the eighth and ninth, allowing one run on one hit. Daniel Reid (Nasonworth, N.B.) threw a hitless ninth. Williams was 2-for-3 at the plate for Canada while Brian Ivan (Toronto, Ont. ), Kyle Fillier (Toronto, Ont.) and Stang also collected hits. 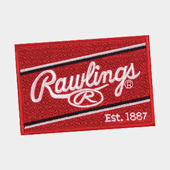 Canada’s next match-up comes against the Atlanta Braves’ instructional team, Friday at 10 a.m. EST.